At Jax Multispecialty Dental Center, we also specialize in treating adults, children and teens in a warm and friendly environment. If you’ve always wanted a beautiful, straight smile, our Jacksonville orthodontics team at Jax Multispecialty Dental Center will meet all of your dental needs. We take pride in creating and maintaining beautiful and healthy smiles. Many different types of appliances, both fixed and removable, are used to help move teeth, retrain muscles and affect the growth of the jaws. These appliances work by placing gentle pressure on the teeth and jaws. The severity of your problem will determine which orthodontic approach is likely to be the most effective. We offer several types depending on your specific need. The most common fixed appliances, braces consist of bands, wires and/or brackets. We offer metal, color or clear braces to straighten your teeth. Stainless steel metal brackets are probably what most people think of when they think of metal braces. They have been used for decades & easily withstand the forces involved in moving teeth. Stainless steel is a kind of steel that has a special coating that prevents corrosion, which is especially important in a wet environment like your mouth. Stainless steel brackets are an affordable option. Ceramic brackets are made from a special clear ceramic that is strong & durable. Ceramic brackets are often preferred because they don’t show up as much as metal brackets & are more resistant to staining than tooth-colored plastic brackets. Thermal wires are flexible & easy to install at room temperature that are then activated by the heat of your body once they’re in place, gently guiding your teeth into position. Modern scientific advances in materials technology means we can offer great choices for cosmetic braces. These braces systems have clear or tooth-colored brackets, preventing the “railroad track” look that traditional all-metal braces systems can give you. From a reasonable distance or in photos, many people won’t be able to notice these braces. Many of the metals used in braces contain some nickel. 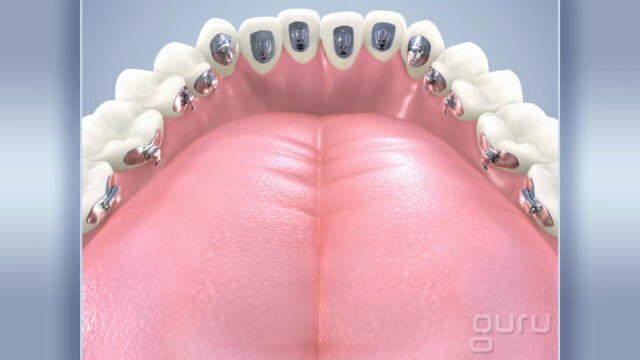 While even patients with a known nickel allergy rarely have a reaction to braces that contain nickel, we are happy to provide nickel-free brackets & wires when indicated. We will ask you before treatment whether you have a nickel allergy & compensate accordingly. If you don’t know whether you have a nickel allergy, we are trained to recognize the allergic response & will replace the brackets or wires causing the reaction when necessary. Copyright © chrisad, inc. All rights reserved. Reproduction or republishing strictly forbidden without prior written permission. Retianers are worn after we have created your new smile. These are custom made just for you. Worn as prescribed is an important part of keeping your improved smile for years to come. A nightguard is an oral appliance that you wear at night while sleeping that helps prevent tooth grinding & jaw clenching. Tooth grinding can eventually lead to damage to teeth that makes them vulnerable to infection & decay. Jaw clenching is often associated with tooth grinding & can lead to jaw problems & even chronic headaches. Wearing a nightguard can prevent these unconscious habits from damaging your smile. Similar to a nightguard is a tooth positioner. These are actually orthodontic appliances that are most often worn after completing other orthodontic treatment, like braces. Tooth positioners help keep your teeth in their new positions & can also continue to make small adjustments to the position of your teeth. Like a nightguard, a tooth positioner is usually worn at night while sleeping. Orthodontic appliances include much more than just different types of braces & retainers. If you have a special case that requires a different kind of treatment, we are prepared to provide custom solutions to help you achieve a healthy, attractive & properly aligned smile. Examples include headgear & palette expanders. Interceptive orthodontic treatment is when we take smaller actions over time to prevent future oral or orthodontic problems. Interceptive treatment is usually started on children the moment the potential for a problem is detected. Examples include breaking a patient of a thumb sucking habit that can lead to a misaligned bite with protruding teeth if it is allowed to continue. Interceptive treatment can make future orthodontic treatment unnecessary or shorten the time of future orthodontic treatments by reducing the severity of the problem ahead of time. Removable functional appliances are orthodontic devices that adjust the bite or the position of teeth, but can be removed when necessary, such as to play sports or for cleaning. Removable functional appliances are usually worn by older children, taking advantage of rapid growth in the face in the early stages of puberty to guide the development of the mouth in a certain way. Think of these appliances as a retainer you wear before you get braces, to help get ready for orthodontic treatment or to keep a developing problem from getting worse (for example, protruding front teeth). There are certain subconscious or impulsive habits that can affect the position of your teeth & the alignment of your bite. The most common culprits are thumb sucking & tongue thrusting. Both can cause an open bite (where front teeth protrude forward & there is a large gap between upper & lower teeth) & other alignment problems. These bad habits can be very hard to break merely by telling the patient there is a problem, especially when the patient is a young child. We can provide oral appliances that discourage these habits & establish new habits that will continue even after the patient stops using the device. This small intervention can save a lot of time & cost in future orthodontic work.